There’s a worldwide fascination in CEOs and I’ve been particularly keen to meet Michael Jordaan, CEO of FNB, which is just outpacing all other SA banks in reputation, innovation and customer-centric offerings. As CapeInfo prepares to launch its online marketing courses, we’re even keener to discover what’s at the root of winning brands. Michael Jordaan (or MJ as he’s widely known) epitomises corporate leaders who lead from the front, in the same vein as Richard Branson and Raymond Ackerman. If one is going to be disappointed in the flesh, it’s because he almost seems too nice. I met him at FNB’s Bankcity corporate HQ – a complex conceived and built in Johannesburg’s downtown during the late 1980s and early 1990s, when other corporate HQs were moving to Johannesburg’s more genteel, northern suburbs. He arrived at our meeting in shirt sleeves, without a tie. There’s none of the arrogance, ego and manic drive one so frequently associates with CEOs. Yet there is the passion for banking combined with a love for technology. “I love my job. I’ve said I’d be happy to work for nothing,” he says. (If there’s a comparison here to Apple’s Steve Jobs famously working for $1 a year, it’s misleading.) In this case, “too nice” is a compliment. Michael does have charisma but it’s wrapped in humility. He’s comfortable with himself and puts others at ease. He’s not assertive and presents concepts easily and with clarity. Where does he come from? “I’m a Stellenbosch boy. I went to Paul Roos and did all my studies at the University of Stellenbosch. That includes a Ph.D. in Economics focusing on Banking Supervision. There was never any doubt that he would follow a banking career, because numbers and finance held his interest from his earliest school days. More recently, he’s gone back to his Stellenbosch roots with the purchase of a wine farm there. His grandfather bought Bartinney in 1952 and Michael was very disappointed when his father sold it about 15 years ago. It had become part of his roots and heritage. When the farm came back onto the market about 6 years ago, Michael and his wife – also from Stellenbosch – decided to buy it back. Top: Views from Bartinney - 'wine made on a mountain' - with views that let the brain breathe! Below: Rose Jordaan and their three daughters in the vineyards.After trying to run it from Johannesburg with a manager on the farm, they found it just wasn’t working. 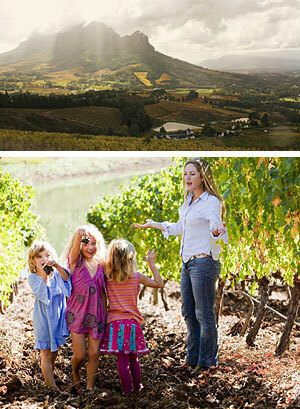 Over a bottle of red wine and dinner at a restaurant one night, Rose suggested that she and the children move to Stellenbosch to run the farm. “So I’m the silent partner. I can make suggestions but they aren’t always followed, and I do make the internet banking transfers each month,” he jokes. One might be tempted to describe Michael as a consummate and pragmatic financial technocrat but that doesn’t tell the whole story. Someone who knows him well describes him as “nerdy in some ways, but not uncool.” His need to return to his roots, “to dirty his hands in the soil” with the re-purchase of the family estate, shows a more-grounded balance. But a penny dropped when I discovered that Rose had been an architect before becoming a wine farmer. Architects are special people, embracing the realms of visual delight, practicality, attention to detail and social responsibility. One can’t be married to one and not be enriched! There’s the old adage: “If something seems to be too good to be true, it is too good to be true.” That doesn’t apply in Michael’s case, but one must ask what gave the bank the confidence to appoint Michael as CEO in 2004. He was very young – 36 at the time – which must have posed an element of risk for a bank with 30,000 staff. 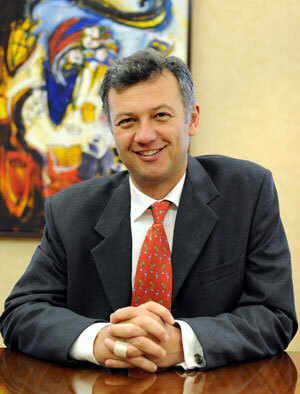 In his blog, Murray Legg, a more recent member of Rand Merchant Bank’s Class Of programme (to attract talented young professionals with a hunger for investment banking into RMB) wrote in Lunch with Michael Jordaan: “It was fascinating to see the fluidity and breadth, as well as the depth of insight he has, not only into his business, but into the economics of the country, international competitors, and the way that he sees retail banking developing into the future. Michael does have a rare clarity of vision and process, without the “reality distortion” and almost messianic charisma of both Steve Jobs and Richard Laubscher (ex-Nedbank CEO). In the late 1990s, Nedbank was on a winning trajectory and then came close to collapse in the early 2000s. Could the same ever happen to FNB? “No,” says Michael, “FNB’s success is rooted in its corporate culture and the tone of that culture. It’s set at the top but it’s an empowering – not a hierarchical – culture. One of the things I wanted to discover was where the bank gets its innovation DNA. Ever since online banking was introduced in the 1990s, FNB’s website was different to all the others. Comparing the FNB and Absa websites, FNB was totally focused on customers; Absa was more focused on selling the bank while logging in required more navigation. Even today, when South African banks review each other’s websites, FNB comes out on top in a recent PWC survey. Don’t the other banks learn? FNB does seem to build on its successes. Some years ago, I complimented Santie Botha, then marketing head at Absa, when they launched free email addresses for clients. She replied that the proposal had come from a UK company and they had run with it quickly, but had no idea where it would lead to. A few years later the bank pulled out of the venture. Bringing PayPal to SA was one of FNB’s offerings which came out of an idea from a member of staff who was prepared to run with it. “People change bureaucracies. I want the culture of innovation to reverberate throughout the company,” says Michael. Nothing demonstrated Michael’s passion for technology better than when I said that I really don’t get FNB’s recently-launched GeoPay. His eyes lit up and he grabbed his iPhone. “How much can I send you without it being construed as a bribe?” he asked, and settled on R20. Seconds later, the R20 was in my account. The ease of transferring funds based solely on proximity, without knowing bank account details or even having an FNB account, opens up a whole new ball park. It will start with personal use, but how long before this is how you pay for goods and services? What makes this possible is the FNB App for smartphones, and FNB is still the only SA bank offering an App. FNB has been smart in its use of social media. M&G’s story in their Top Companies report: First with Facebook Banking points out that whereas call centres are usually run by the operations people, the new-fangled social media stuff is often set up and run by the marketing department. FNB deliberately set up its social media channels to feed into its existing customer care system. For new and more connected users, the FNB Twitter account @rbjacobs is a far more convenient alternative to using a call centre. And using it works with efficiency that’s extremely rare! When I left my appointment with Michael, I wanted to take a photograph of Bankcity, showing its juxtaposition to the hustle and bustle of its old Newtown neighbours – because nothing demonstrates FNB’s relationship to the communities it serves better. I was stopped from taking photos by a security guard – a frequent occurrence at many places in SA – because it’s against security policies. A tweet to @rbjacobs was answered minutes later, followed by an email interchange. Less than a week later I had a call from a really cool guy – Kagiso Nonyana, Facilities Manager – who said the issue had been taken up with FNB’s security management and “the outdated policy has been revoked and we hope you’ll come back to take photographs.” How many big companies are that fleet-footed? FNB operates in a very unusual society – a combination of first and third worlds, and many cultures. It embraces people who enjoy standing in queues because it’s part of socialising, and those who will avoid queues at any cost. Through its offerings online, at traditional branches (some differentiated by extended banking hours) and new FNB EasyPlan branches, FNB is catering for everyone. EasyPlan (with banking fees from only R3.95 a month!) offers basic services and saw one of the fastest branch rollouts ever – about 100 branches in one year. 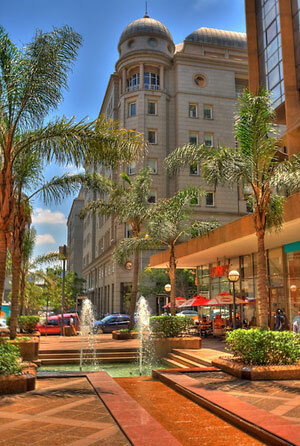 FNB is expanding its African footprint and recently opened in India. “There is a cultural fit and we can leverage our technological innovations, especially for cellphone banking,” he says. What also sets Michael apart is that you can still see the Stellenbosch boy in him. It’s something I recognise – I was born in Stellenbosch, went to Paul Roos and the University of Stellenbosch 20 years before he did. Interviewing Michael brought back memories of how simple and straightforward life ought to and can be. I’m sure that’s the way he runs FNB – with apparent ease and a whole lot of fun. The only question I haven’t answered is where the bank, established in 1838, gets its innovation DNA. When was that introduced into its corporate culture/gene pool? If there are any FNB historians out there, please share this with us.